Spicy rice cake or “tteok-bokk-i” in Korean is one of my most favorite snacks here. It’s a street food available anywhere :D. Basic tteokboki is made from tubular rice cakes with hot sauce made from “ko-chu-jang” (red pepper paste). Some vendors spiced it up more by adding eggs and fish cake. In Seoul, there’s a street filled with restaurants specializing in this snack. It’s located in Sindang-dong (subway line #2, exit 7) in Jung-gu (the district was mentioned in “My Sassy Girl”). It’s about a kilometer away from where I live but I’ve only been there twice. The first time was when they held a “Tteok-bokk-i Festival” last year and the second time was Thursday last week with Anna. As it was a weekday afternoon, the place was almost empty. There were so many restaurants to choose from but we decided to go to “I Love Sindang-dong” which is the biggest, most popular place there. On the door of the restaurant, you’ll find autographed notes and pictures from celebrities who’d probably been there. Inside, there’s a giant vidi wall and a DJ’s booth near it. There’s a staircase to the second floor to accomodate more customers. Anna and I sat on one of the wooden tables with a single cooking range on it. The menu consisted mainly of tteok-bokk-i variations such as “hae-mul tteok-bokk-i” (seafoods, noodles, rice cakes, eggs), “bulgogi tteok-bokk-i” (with beef) and others which had escaped my memory :D. The cheapest item on the menu is 8,300 KRW for two persons. We ordered the bulgogi variety at 13,000 KRW for two. 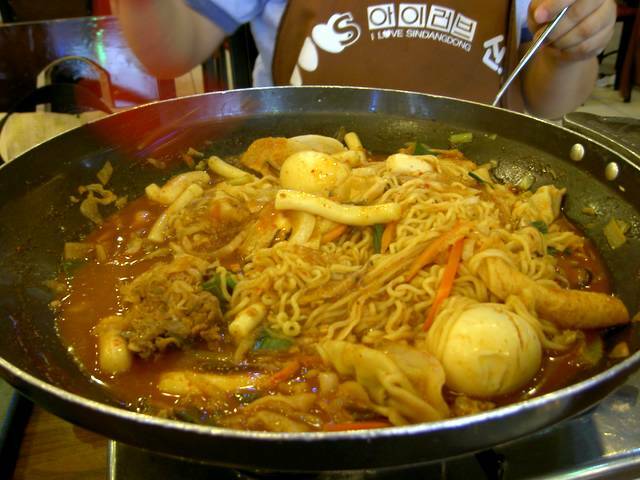 It has eggs, beef bulgogi, mandu (dumpling), noodles, rice cakes (of course! ), special sauce and vegetables. It arrived on our table uncooked, so you have to cook it yourself. There are aprons available that you can wear to protect your clothes from the spattering sauce. The bulgogi tteokbokki was good. Needless to say, we cleaned the pan where the rice cake was cooked. It’s a tradition in this place to have an ice cream after every meal. We just decided to get the ice cream from the nearby Baskin Robbins. 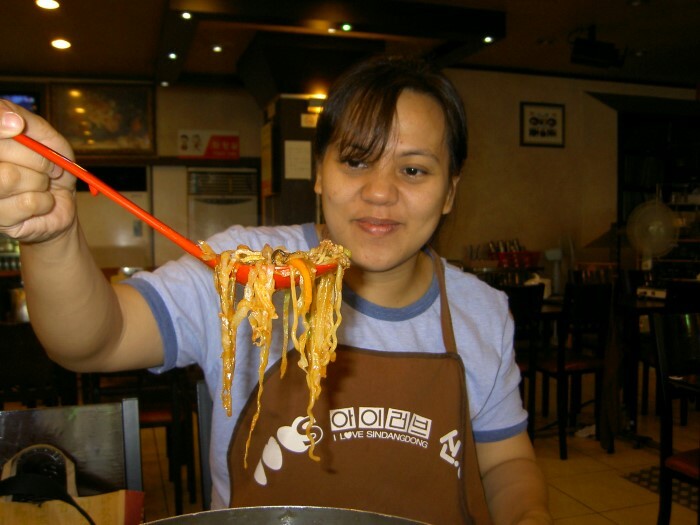 If you want to try homemade tteokbokki, here’s a recipe from the Korean Kitchen. Be warned that this one is really hot as I’ve tried it before. What are some good things to top on rice cakes?I’m trying to mix up rice cakes as my snacks as opposed to chips or sweets. I’m looking for good suggestions for healthy toppings to make them seem not so bland.Thanks.